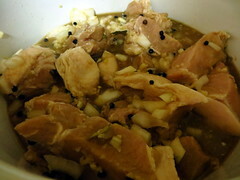 Heh…Heh…Heh… | Hapa...Shot the Food! ← DC Beer Week? Woohoo! Last Sunday, Dan and I went with a couple friends on a day trip to Ocean City, MD. Most of the morning and early afternoon was spent on the beach: soaking up rays, playing and swimming in the ocean, and just relaxing on the sand. Did they get crabs while making that Booty’s call? 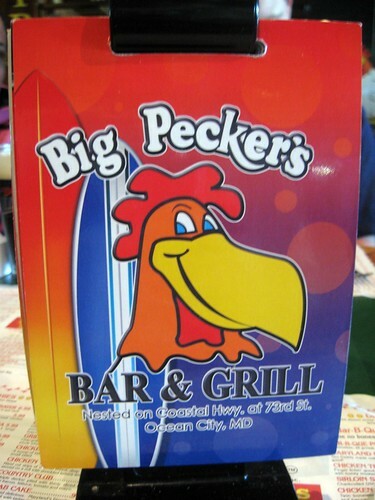 Big Pecker’s was a restaurant that we passed by a lot on previous trips to Ocean City. 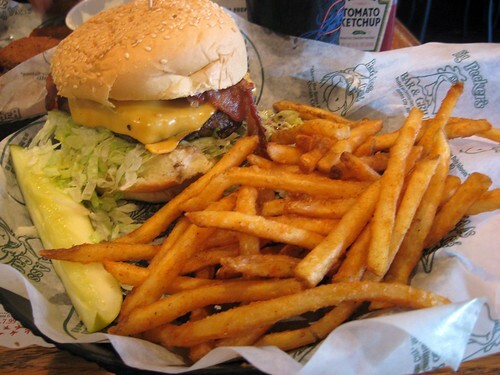 It was just too hard to resist this go around, so we stopped by there for an early dinner. Apparently, we came in early enough to take advantage of happy hour prices (and a less-crowded restaurant). 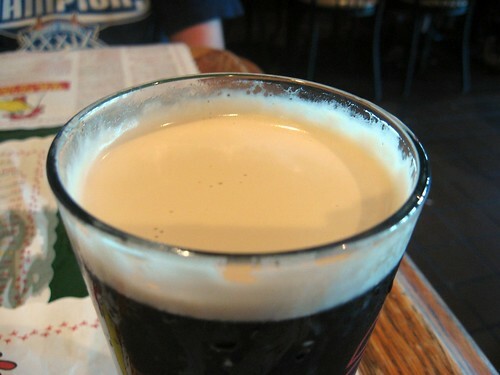 One friend’s beer was only $2.50, while my Guinness was $3.50. Sweeeeeet! 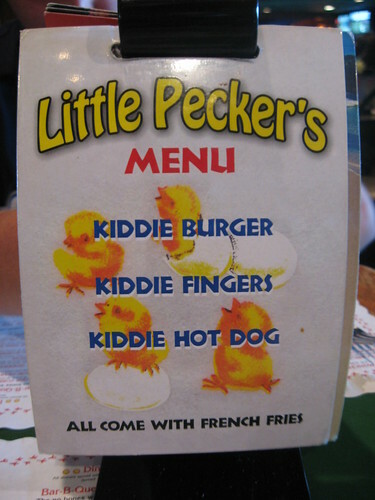 You can’t say they discriminate…there’s a menu for Little Peckers, too! 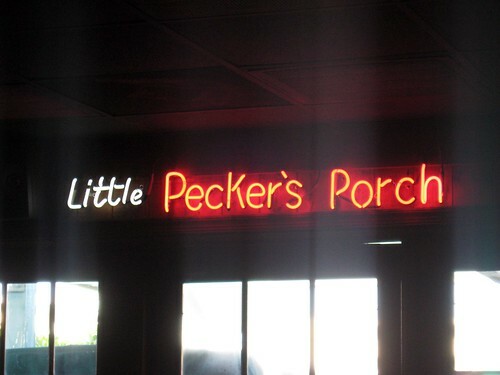 …and a Little Pecker’s Porch! A bit more seriously, this place is fairly family-friendly… suggestive name or no suggestive name. Even at a less-crowded time we saw several families seated inside, enjoying the food. Several others were enjoying the outdoor bench-swings on the porch. 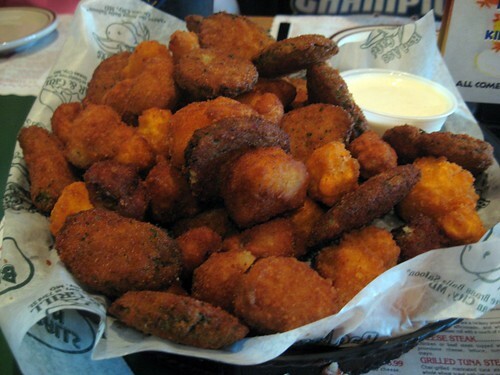 As a first course, our group split an appetizer of batter-fried vegetables (zucchini, cauliflower, and mushrooms). 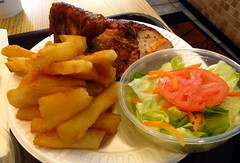 We so did not expect this much food to come… more than enough for four. JD got a buffalo chicken salad (unfortunately, not pictured), while the rest of us got various burgers. Mine was a fine 1/2 pound specimen of moo-cow called the “OH my Bacon Back Burger”. It was cooked to perfection and topped with cheese, bacon, lettuce, tomato and mayo…so juicy that I had to perform a modified version of “the (Philly Cheese Steak) Hunch” (yep… also a Guy Fieri-ism) to make sure juices didn’t fall on my shirt. All in all, our food came out quickly, and the service more than decent (a little slow after we paid… took us a while to get boxes). We were glad that we came in when we did, though…As soon as we headed out the door, the lines heading into the bar and grill looked much longer. 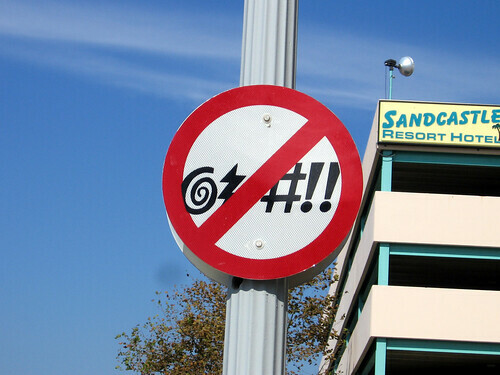 * OK, so maybe Virginia Beach might be an exception given that they have decency ordinances… like a no-swearing ordinance (these funny signs remind visitors of that). Posted on August 19, 2009, in eating out, travel, Uncategorized and tagged "Big Pecker's", "Ocean City", burgers, silliness. Bookmark the permalink. Leave a comment.